My friend Buster Simpson is an artist/activist who thinks globally and acts locally. His eye-opening career retrospective at the Frye Museum in Seattle opens with a grainy super-8 film of Buster from a few decades earlier. He’s a naked young David with a slingshot, symbolically launching his anti-acid rain purge stones at the Goliaths in the World Trade Towers. 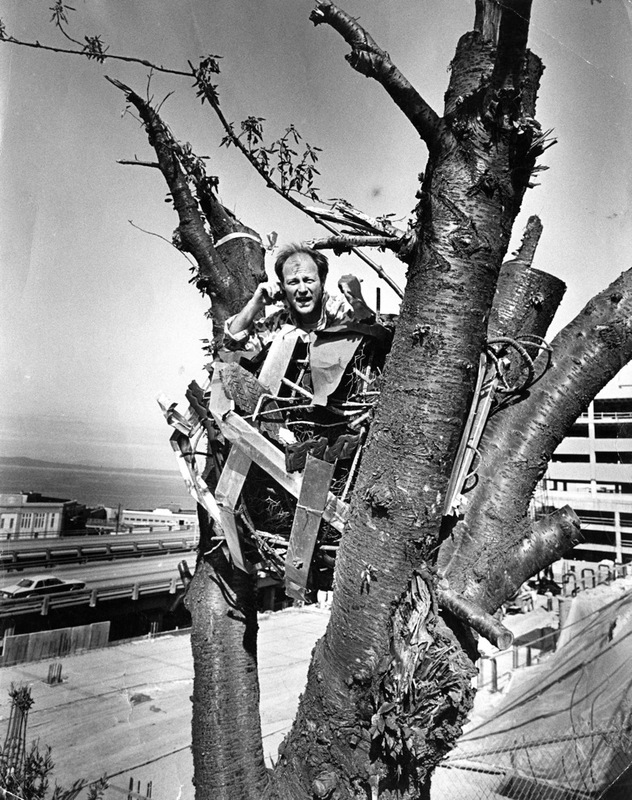 Buster is a art and environmental provocateur, a surveyor of lost places, a man who occupied the upper branches of a 100 year-old cherry tree to save it from Seattle condo developers then made a ladder out of the remains of the cherry tree so that he could climb into the next tree and try to save it from developers. Buster was my neighbor in funky downtown Seattle in the early 1980’s; we called him the mayor of Belltown. His intrepid dumpster diving kept our artists’ tenement well-supplied with day-old pastries from the Pike Place Market. On this trip in August, as we waved goodbye to Buster, heading south from Seattle for Portland, he admonished us not to miss “the Wobbly murals in Centralia.” So we veered off the highway into that modest Lewis County town, its only claim to fame, as far as I knew, as the birthplace of avant-garde choreographer Merce Cunningham. What I didn’t know was that Centralia was the site of an anti-labor massacre, where an innocent man was lynched, castrated and hung from the bridge on the Chehalis River. The man’s name was Wesley Everest. He was a veteran and a member of the I.W.W. (International Workers of the World). He was pulled out of jail, handed over to his persecutors and murdered in the dark of night. The next morning, when Centralia schoolchildren crossed the bridge to go to school, his mutilated body still dangled over the river. A sleepy teenager in front of a liquor store drew a blank when we asked the location of the Wesley Everest mural but the fireman polishing his hook and ladder gestured toward City Park. There, on the façade of the old Elks Lodge (now an antique mall), is the magnificent 1997 mural by artist Mike Alewitz: “The Resurrection of Wesley Everest.” The mural commemorates the disastrous events of Nov 11, 1919, when members of the town’s business elite enlisted the American Legion, then a new veterans group, to attack the hall of the I.W.W. and lynch its secretary. In Alewitz’ visual narrative, the spirit of Wesley Everest rises out of his pauper’s grave, half-clothed in his veteran’s uniform, half in his logger’s overalls, both hands clenched and arms raised upwards to the sky. From a well-informed man who worked inside the building, we learned that City Park was the very place where the crowd assembled before the raid on the labor hall. Our informant told us how the Armistice Day Tragedy had been “Centralia’s secret” for over eighty years. Further study in the Los Angeles Public Library stacks (The Centralia Conspiracy,by Ralph Chapin, 1919) and the viewing today, on Labor Day, of a superb film documentary (“Lewis County Hope and Struggle: A Community Remembers the Wobbly War) by Olympia, WA-based filmmaker Anne Fischel tells labor’s side of the story. 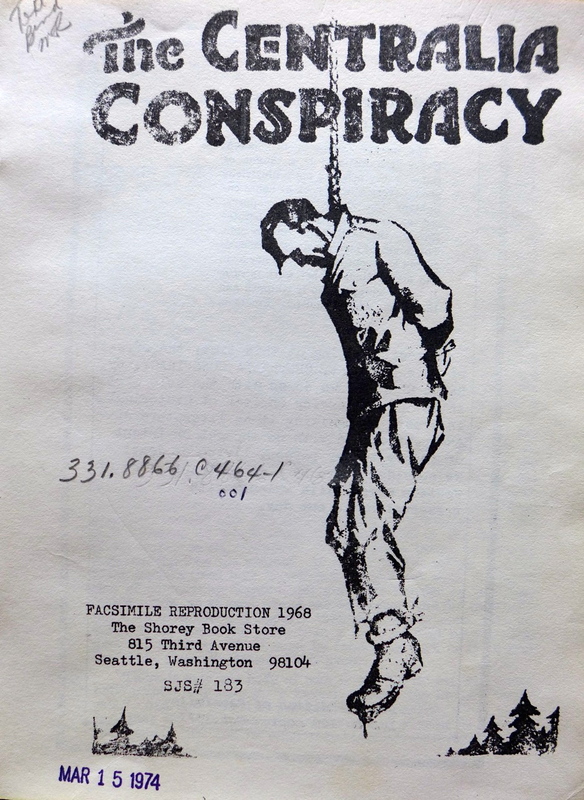 Fischel’s film corroborates the conspiracy on the part of the lumber interests to commit murder and violence to drive organized labor out of their domain. The lumber barons had no intention of limiting their profits on virgin timber by providing health care for their workers, by limiting their dangerous long work days, by ameliorating their miserable working conditions in the soggy NW lumber camps. 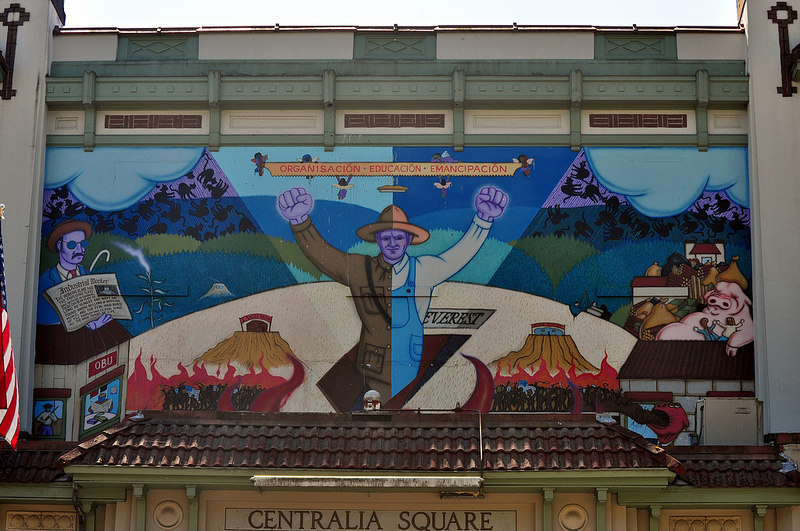 In a scene in her film, at the mural’s dedication in Centralia, in 1997, Fischel pans the assembled crowd. Lewis County was then in the grip of a terrible economic recession. These are working men and women, their faces creased and worn; the worry shows. Several of these witnesses are descendants of those I.W.W. loggers who went to prison for ten + years for their beliefs that there should be a more just society. Alewitz reminds them all how the I.W.W. threatened business interests at the time because they dared to ask, “in whose interest should society be run?” It’s a question that Buster Simpson asks in his work, and on this Labor Day, with the spirit of Wesley Everest watching, it is a question we must all continue to ask.